My latest Covent Garden discovery is a fabulous night of film, fizz and dining at the stunning five-star hotel, One Aldwych. Settle down into luxurious Italian leather armchairs in the private cinema that seats 30. This is the way to go to the movies, not only a large flatscreen, great HD picture and Dolby surround sound, but you get to enjoy a glass of champagne and a box of fresh, warm popcorn. And there’s no ads or boring preambles. After the movie we were escorted by the charming, smiling staff through the somewhat maze-like hotel to Axis restaurant. The welcome here is, well, very welcoming. The restaurant’s all very modern and stylish and the food turned out to be fabulous. It’s the creation of Executive Chef Dominic Teague who offers a modern British menu with three choices for each course, in this case, and Sommelier wine matching suggestions. The restaurant doesn’t have natural light so is beautifully moody as you can tell from my pictures. Love the pinkish glow. 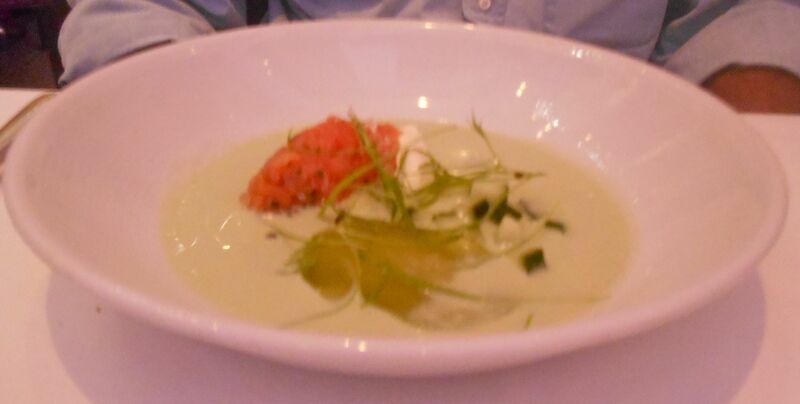 The chilled cucumber soup was beautifully fresh and came with salty John Ross smoked salmon, radish and creme fraiche. A wonderful summery starter and one I’m tempted to try making at home. This is one of my favourite starters, and here’s a truly superior version of it. It’s Teruel P.D.O ham and Charentais melon with a midori dressing. Teruel ham comes from white pigs born and bred in the province of Tereul in Aragon in Northern Spain and it’s beautiful, delicately delicious and melt-in-the-mouth and the perfect complement to the sweetness of the melon. 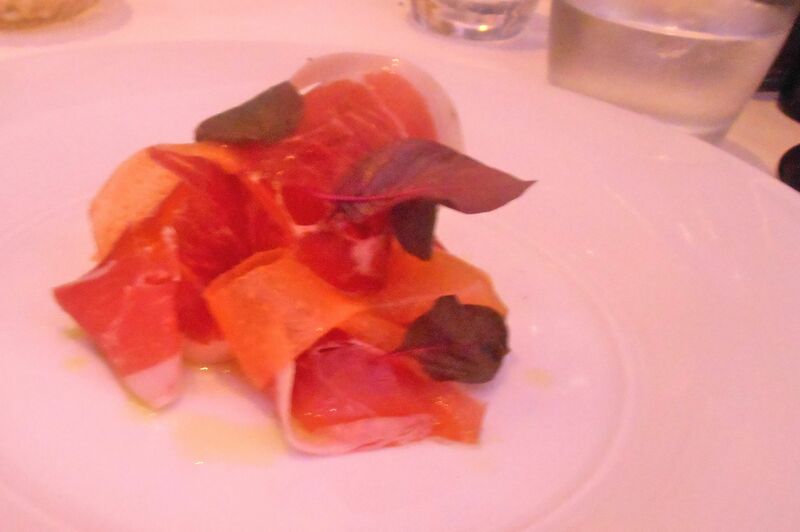 A clever touch was to serve both the ham and the melon in thin strips. Just wonderful. This spring/summer has been very much about green ingredients for me. I find myself ordering vegetarian dishes (like this one) in restaurants because the produce has been so tasty this year. 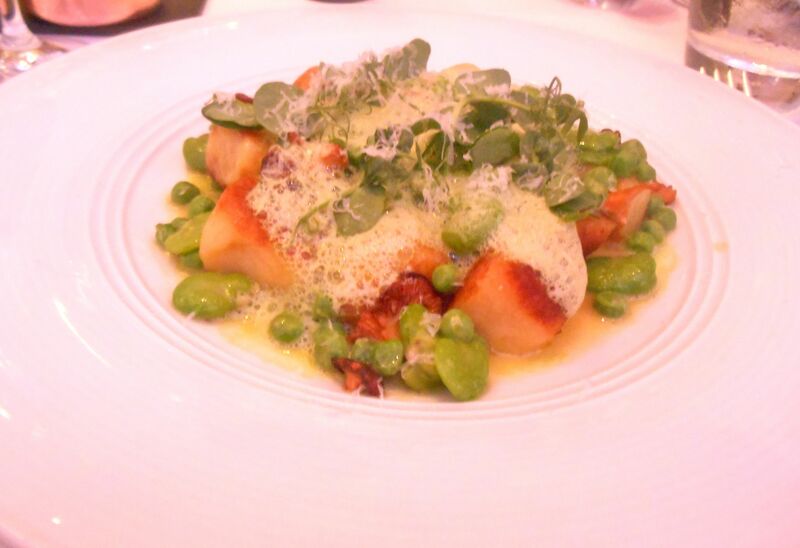 This potato gnocchi came with girolles, peas, broad beans and Parmesan. A wonderful mix, with the earthiness of the girolles, the sweetness of the peas and beans (they just work so perfectly together) and the salty depths of the Parmesan. Soft food to delight. 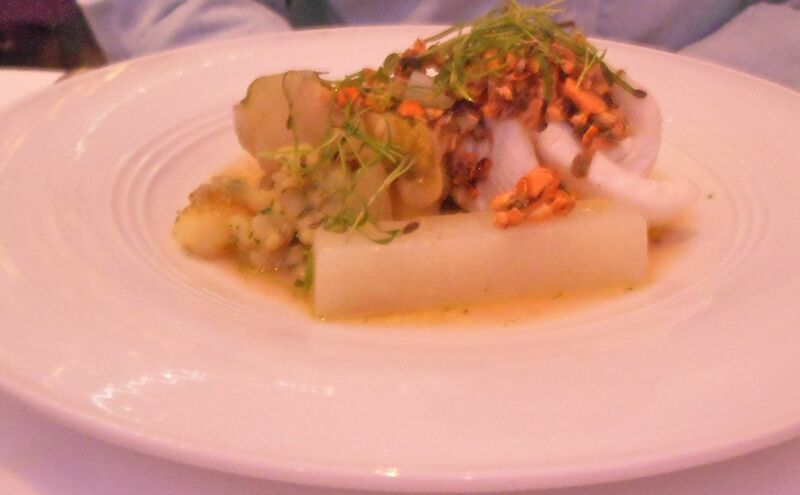 The Brixham plaice was served with fennel, kohlrabi and mussel jus. Fresh and light with delightful flaky chunks of fish and crunchy veg. A thoroughly lovely and different way to spend an evening in Covent Garden. The opportunities seem to be endless in my favourite part of London. Oh, nearly forgot, the movie we saw was The Monuments Men which was interesting and entertaining with a good performance by Cate Blanchett, who I didn’t recognise until halfway through. 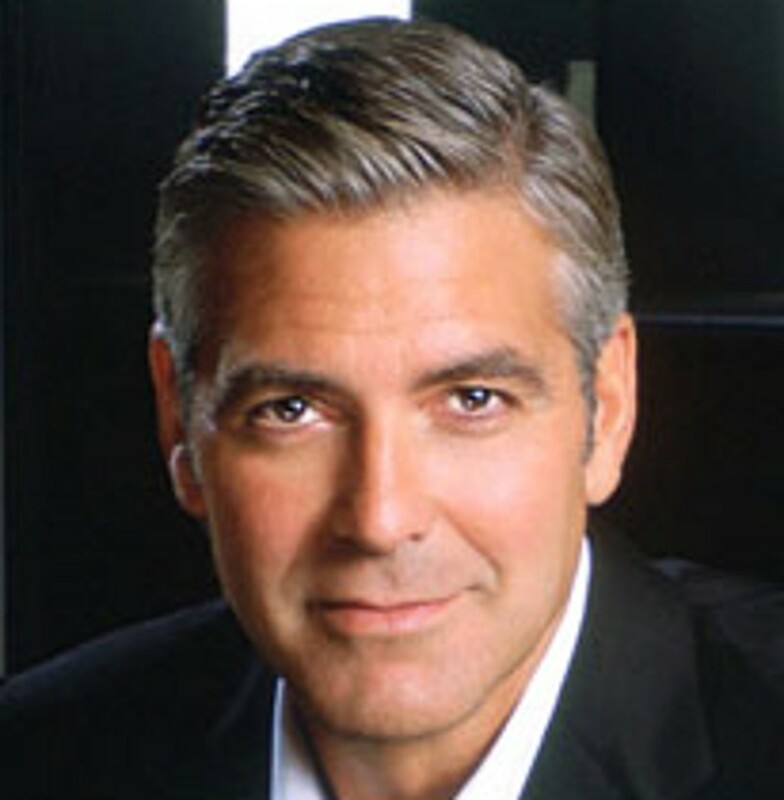 And it had George Clooney in it…what can I say, nothing wrong with a bit of George Clooney. And it’s given me an excuse to post a picture of him, too! Go Gorgeous George!